The advancement of science generally depends on the interplay between experimental studies and theory. In some cases, theoretical physics adheres to standards of mathematical rigour while giving little weight to experiments and observations. [a] For example, while developing special relativity, Albert Einstein was concerned with the Lorentz transformation which left Maxwell's equations invariant, but was apparently uninterested in the Michelson–Morley experiment on Earth's drift through a luminiferous aether. Conversely, Einstein was awarded the Nobel Prize for explaining the photoelectric effect, previously an experimental result lacking a theoretical formulation. 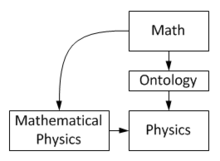 Theoretical physics consists of several different approaches. In this regard, theoretical particle physics forms a good example. For instance: "phenomenologists" might employ (semi-) empirical formulas to agree with experimental results, often without deep physical understanding. [c] "Modelers" (also called "model-builders") often appear much like phenomenologists, but try to model speculative theories that have certain desirable features (rather than on experimental data), or apply the techniques of mathematical modeling to physics problems. [d] Some attempt to create approximate theories, called effective theories, because fully developed theories may be regarded as unsolvable or too complicated. Other theorists may try to unify, formalise, reinterpret or generalise extant theories, or create completely new ones altogether. [e] Sometimes the vision provided by pure mathematical systems can provide clues to how a physical system might be modeled;[f] e.g., the notion, due to Riemann and others, that space itself might be curved. Theoretical problems that need computational investigation are often the concern of computational physics. Theoretical advances may consist in setting aside old, incorrect paradigms (e.g., aether theory of light propagation, caloric theory of heat, burning consisting of evolving phlogiston, or astronomical bodies revolving around the Earth) or may be an alternative model that provides answers that are more accurate or that can be more widely applied. In the latter case, a correspondence principle will be required to recover the previously known result. Sometimes though, advances may proceed along different paths. For example, an essentially correct theory may need some conceptual or factual revisions; atomic theory, first postulated millennia ago (by several thinkers in Greece and India) and the two-fluid theory of electricity are two cases in this point. However, an exception to all the above is the wave–particle duality, a theory combining aspects of different, opposing models via the Bohr complementarity principle. Among the great conceptual achievements of the 19th and 20th centuries were the consolidation of the idea of energy (as well as its global conservation) by the inclusion of heat, electricity and magnetism, and then light. The laws of thermodynamics, and most importantly the introduction of the singular concept of entropy began to provide a macroscopic explanation for the properties of matter. Statistical mechanics (followed by statistical physics and Quantum statistical mechanics) emerged as an offshoot of thermodynamics late in the 19th century. Another important event in the 19th century was the discovery of electromagnetic theory, unifying the previously separate phenomena of electricity, magnetism and light. The pillars of modern physics, and perhaps the most revolutionary theories in the history of physics, have been relativity theory and quantum mechanics. Newtonian mechanics was subsumed under special relativity and Newton's gravity was given a kinematic explanation by general relativity. Quantum mechanics led to an understanding of blackbody radiation (which indeed, was an original motivation for the theory) and of anomalies in the specific heats of solids — and finally to an understanding of the internal structures of atoms and molecules. Quantum mechanics soon gave way to the formulation of quantum field theory (QFT), begun in the late 1920s. In the aftermath of World War 2, more progress brought much renewed interest in QFT, which had since the early efforts, stagnated. The same period also saw fresh attacks on the problems of superconductivity and phase transitions, as well as the first applications of QFT in the area of theoretical condensed matter. The 1960s and 70s saw the formulation of the Standard model of particle physics using QFT and progress in condensed matter physics (theoretical foundations of superconductivity and critical phenomena, among others), in parallel to the applications of relativity to problems in astronomy and cosmology respectively. ^ There is some debate as to whether or not theoretical physics uses mathematics to build intuition and illustrativeness to extract physical insight (especially when normal experience fails), rather than as a tool in formalizing theories. This links to the question of it using mathematics in a less formally rigorous, and more intuitive or heuristic way than, say, mathematical physics. ^ Sometimes the word "theory" can be used ambiguously in this sense, not to describe scientific theories, but research (sub)fields and programmes. Examples: relativity theory, quantum field theory, string theory. ^ The work of Johann Balmer and Johannes Rydberg in spectroscopy, and the semi-empirical mass formula of nuclear physics are good candidates for examples of this approach. ^ The Ptolemaic and Copernican models of the Solar system, the Bohr model of hydrogen atoms and nuclear shell model are good candidates for examples of this approach. ^ Arguably these are the most celebrated theories in physics: Newton's theory of gravitation, Einstein's theory of relativity and Maxwell's theory of electromagnetism share some of these attributes. ^ This approach is often favoured by (pure) mathematicians and mathematical physicists. ^ "The Nobel Prize in Physics 1921". The Nobel Foundation. Retrieved 2008-10-09. 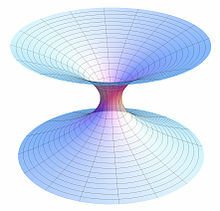 ^ Theorems and Theories Archived 2014-08-19 at the Wayback Machine, Sam Nelson. ^ Mark C. Chu-Carroll, March 13, 2007:Theorems, Lemmas, and Corollaries. Good Math, Bad Math blog. ^ Enc. Britannica (1994), pg 844. ^ Enc. Britannica (1994), pg 834. ^ Simplicity in the Philosophy of Science (retrieved 19 Aug 2014), Internet Encyclopedia of Philosophy. ^ See 'Correspondence of Isaac Newton, vol.2, 1676–1687' ed. H W Turnbull, Cambridge University Press 1960; at page 297, document #235, letter from Hooke to Newton dated 24 November 1679. ^ Penrose, R (2004). The Road to Reality. Jonathan Cape. p. 471. ^ Penrose, R (2004). "9: Fourier decompositions and hyperfunctions". The Road to Reality. Jonathan Cape. Physical Sciences. Encyclopædia Britannica (Macropaedia). 25 (15th ed.). 1994.